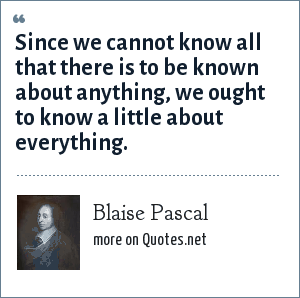 Blaise Pascal: Since we cannot know all that there is to be known about anything, we ought to know a little about everything. "Blaise Pascal Quotes." Quotes.net. STANDS4 LLC, 2019. Web. 23 Apr. 2019. <https://www.quotes.net/quote/16246>.